Mr James Comans at Desoto Central Middle School, in Mississippi, has been chosen to be the first recipient of the Atmospheric Sciences Trunk. This trunk provides a Portable Weather Station and state science curriculum targeted projects and classroom lesson plans as well as a literature component. The trunk program is designed to provide the student with direct observation and lessons on understanding and interpretation of the atmospheric sciences. STEAM programs add art to STEM curriculum by drawing on design principles and encouraging creative solutions. In 2013, a joint resolution was introduced in the United States House of Representatives expressing the sense that adding art and design into Federal programs that target the STEM fields encourages innovation and economic growth in the United States. The Northern Gulf Institute (NGI) at Mississippi State University is proud to announce a STEAM art competition, where original drawings, paintings, photography, or other renderings, depicting the natural environment, marine, avian, or aquatic species, the ocean, or weather, as related to the Mississippi River, The Gulf Coast, or the Gulf of Mexico Basin, are to be submitted for review. The winner of the competition will have their art featured in the "Portal" Newsletter. 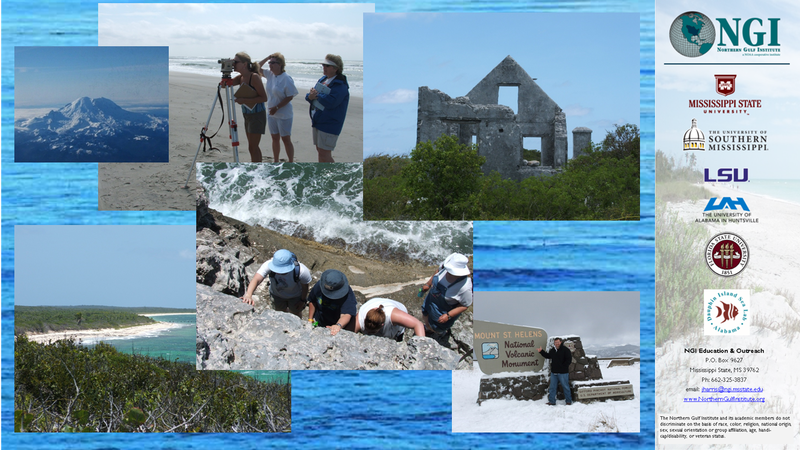 The Northern Gulf Institute (NGI) has joined with the Department of Geosciences and the Center for Distance Education at Mississippi State University to provide Continuing Education and/or 4 hours of Graduate College Credit to teachers and professionals wishing to undertake a 7-10 day geosciences field course. The course locations for this year are Bahamas (split undergrad/grad), Western WA, NY, and Great Plains Storm Chase. A science background is helpful to successfully complete these courses and cost $1250 plus tuition (4 hours of in-state grad credit). (approximately $2978 total) Additionally, for most of the trips the students pay for their meals, but the Bahamas trip includes meals. Students are also responsible for getting to the start location on their own (e.g Seattle, Nassau, Oklahoma City, etc.). The NGI can also provide assistance in locating a guest speaker for your classroom or organizations meeting to discuss various topics including Coastal Hazards, Geospatial Data Integration and Visualization, Ecosystem Management Climate Change, and use of UAV/AUVs in the environmental and agricultural sciences. The Mississippi Science Teachers Association has been an advocate for the promotion of Science Education in the state of Mississippi since the early 1960's. Lead by some of the most dedicated and noted science educators, the organization continues to provide leadership in the development of science standards used in Mississippi classrooms. Boasting a membership of nearly 500 science educators from elementary and secondary schools, community colleges, and senior colleges all over the state, the organization has provided opportunities for science educators to remain abreast of the latest pedagogical techniques through workshops and presentations at the annual conference as well as publication of the newsletters provided to all members.